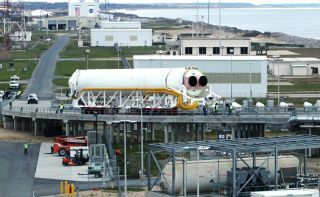 WASHINGTON — Orbital Sciences Corp. on Thursday (Sept. 27) scrubbed a planned rollout of the first stage of its Antares rocket, which was headed to the launchpad for a long-awaited hold-down test, because of problems with the horizontal transporter used to move the rocket to its launch site. The rollout, which was scheduled to begin around 8:00 a.m. EDT (1200 GMT) Thursday, was rescheduled for Saturday morning (Sept. 29) because of a “battery issue” with the transporter vehicle used to haul Antares from its hangar to Pad 0-A at NASA’s Wallops Island Flight Facility in Virginia, Orbital spokesman Barron Beneski said in an email that reached Space News at 2:30 p.m. EDT (1830 GMT) on Thursday. Virginia-based Orbital was preparing to bring the Antares first stage to Pad 0-A for a hold-down test that, Beneski said, will take place several weeks after the rocket stage is set up at the pad. The battery issue with the transporter showed itself early in the rollout process, according to an internal Orbital email. “We experienced a problem with the transporters,” Mike Whalen, Orbital’s field site manager, wrote just before 11 a.m. in the email, which was obtained by Space News. “They checked out ok last night and early this morning, but one died when we attempted to roll. “Team is trouble shooting and we know for sure that we have a power problem. We are getting new batteries delivered Pocomoke now. After installing them we will perform transporter checkout. If no fault code exist[s], we will probably roll out around 12:30 if all goes well,” Whalen wrote. Beneski had no immediate comment on the status of the transporter checkout. Whalen could not be reached for comment. The planned Antares first-stage hold down is a critical milestone for Orbital. The test, if successful, will clear the way for the first flight of the full Antares launch vehicle by the end of this year, Beneski said. NASA spokesman Jeremy Eggers did not immediately reply to a request for comment. Because Pad 0-A is located on a NASA range, the U.S. space agency has responsibility for certifying that it is fit for launch. Delays in obtaining that certification, which Orbital blamed on the Virginia Commercial Spaceflight Authority that operates the Mid-Atlantic Regional Spaceport on Wallops Island, have prevented Orbital from completing the remaining milestones in its Commercial Orbital Transportation Services (COTS) agreement with NASA. Under the COTS agreement, Orbital has to perform two flight demonstrations of its Antares rocket, including one where the vehicle boosts the company’s unmanned Cygnus cargo capsule to the International Space Station. Orbital plans to use these vehicles to fulfill its $1.9 billion Commercial Resupply Services contract with NASA. The 2008 agreement calls for Orbital to make eight cargo delivery runs to the orbiting lab.